Would you like to learn more about backyard cottages and tour a newly completed 800 sq. ft. cottage in Seattle's Magnolia neighborhood? Please join representatives from Microhouse, Carlisle Classic Homes, and ANR Landscape Design for an open house and information session on January 15th. Ben and January are one of the first Magnolia families to take advantage of the recently expanded backyard cottage ordinance that allows backyard cottages in all of Seattle's neighborhoods. Cottages can have many uses including housing an aging family member, providing rental income, or even as a downsizing strategy. They plan to use their newly constructed cottage as a vacation rental in the near term with plans for January's father to live in the cottage when he retires. A great advantage for a family with two small children. Building this cottage involved overcoming a number of challenges including working in ECA (environmentally critical area) steep slope site and limited budget. Stop by and and talk with us to see how we worked with these challenges to create a great 800 sq. ft. two bedroom home. This cottage will be available as a vacation rental. For those interested in renting the cottage please contact. Welcome to the future. The median U.S. house size continues to decrease from it's peak in 2007. Excerpt from the year end review in Zillow's blog. Rather than space-age technology, the biggest thing that is expected to change in future single-family homes is the size. According to the results of the study, surveyed home builders expect new single-family homes to check in at an average of 2,150 square feet. Current single family homes measure around 2,400 square feet, which is already a decrease from the peak home size in 2007 of 2,521. Thank you everyone for a great year of designing and building small houses! 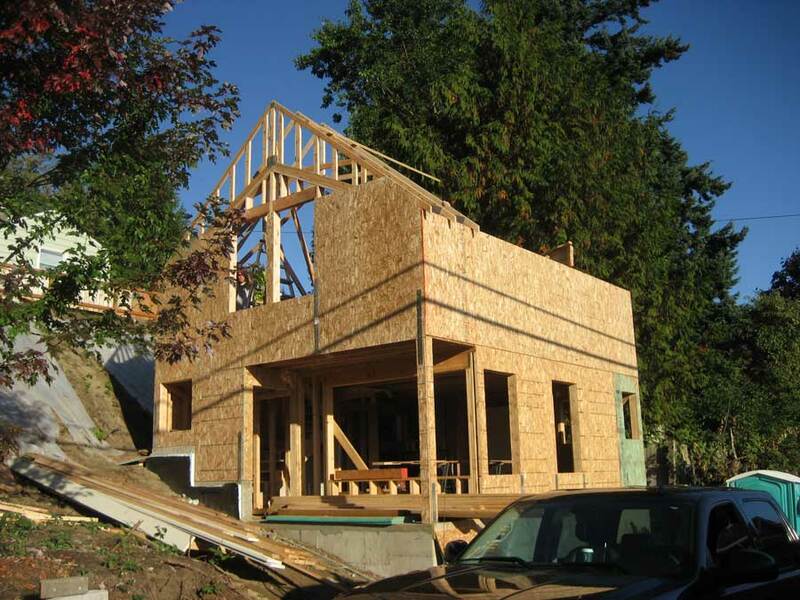 The city of Sammamish City Council will be doing a second reading of there proposed zoning code changes that would provide for a demonstration project of up to 50 cottage housing units at their regularly schedule meeting tonight. The current proposal needs help. Those interested in cottage housing should show up to support cottage housing or email the city clerk Melonie Anderson. Microhouse is currently working with a Sammamish landowner to develop his one acre parcel retaining his house and building seven cottage houses. Under the current Town Center zoning he cannot. He is allowed to develop rowhouses and apartments neither of which are suited to his beautiful steeply sloping wooded lot. Modifying the cottage housing provisions will give him flexibility to design with nature and result in a better project while increasing housing options and density, goals of the town center plan. Currently the number of cottage housing units in the town center zones and in the proposed amendment is limited to 15% of the total units in a development. This restriction is redundant and unnecessarily restricts small scale projects. For example, in the TCB zone, the minimum density is also established at 8 per acre. Thus to do an 8 unit cottage housing development would require a 5 acre development of 53 total units. A 53 unit development is well beyond the range of most local builders. Why is this a problem? Only large national developers like the Toll Brothers will be able to build cottage housing after aggregating large parcels of land. Small land owners interested in developing their property will be required to sell, relinquishing control of their land. This will result in large cookie cutter development that doesn't reflect the character of Sammamish or the will of it's residents. Sammamish is blessed with a beautiful and varied natural landscape full of mature forests and waterways. Eliminating the 15% restriction for cottage housing will result in better built projects that reflect the community, meet the stated goals of the town center plan and give builders more flexibility in protecting the natural environment. The 15% restriction should be removed from the demonstration project and also from Town Center as well. 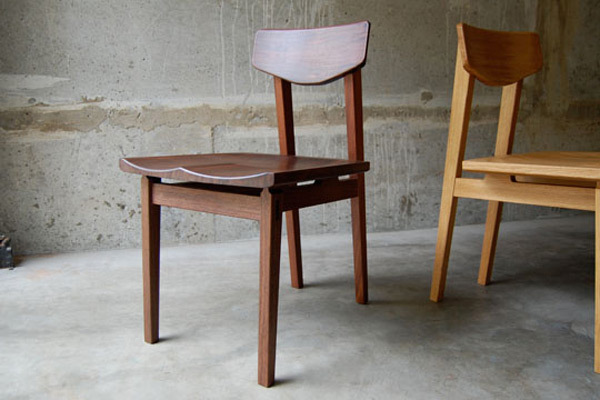 16th workshop is a Seattle based furniture company that designs modern furniture of craft and permanence out of sustainably harvested NW hardwoods. All of their furniture is built by hand in Seattle, using centuries-old joinery methods. The company was founded in 2008, by husband and wife team Chris Armes & Sharon Khosla, who were both trained as architects and worked for some the Northwest’s leading architecture firms. 16th workshop offers a product line of painstakingly designed furniture that is suitable for residential or commercial use. 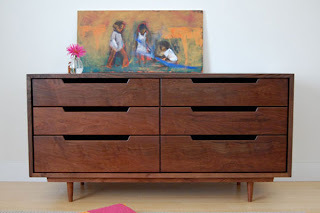 The young company has enjoyed early success and have been nationally recognized for the timeless elegance and quality of their furniture by publications such as: Dwell, Sunset, Interior Design, Apartment Therapy, and many others. 1205 E. Pike Street. Suite BA (entrance on 12th). What are backyard cottages? They are detached houses that share a lot with a primary residence, and they have been allowed throughout Seattle since November of 2009. They can be used for many things including housing an ageing family member, a caretaker, a rental unit or an office. These small houses provide opportunities for families, while increasing housing stock, density and affordability. Join Microhouse, Ncompass Cottage Company, and Justin Arnold to learn more about backyard cottage design, construction, and use. Bring your ideas, after the presentation we will have plenty of time to answer questions about the specifics of your project. 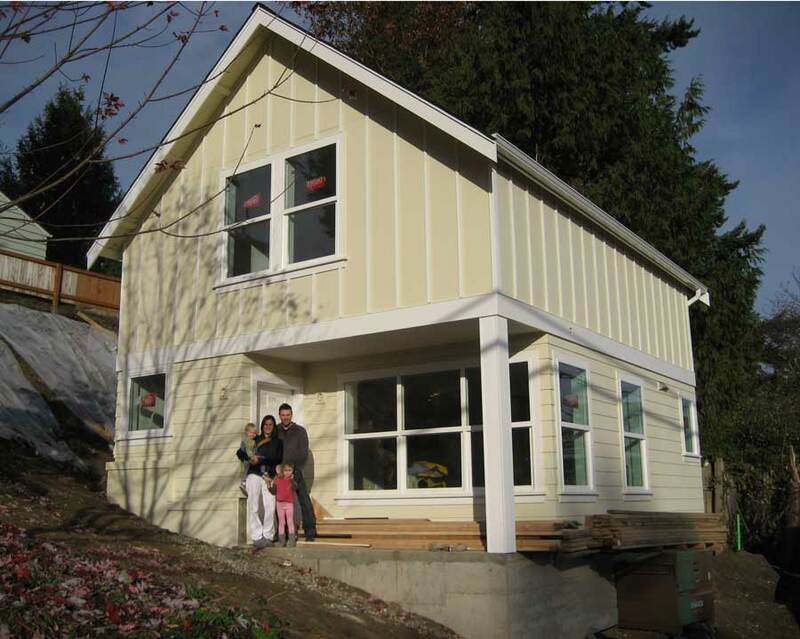 Backyard Cottages - Financing: November 9th, from 7:00 to 8:00 PM, at the Community School of West Seattle, 9450 22nd Avenue Southwest. Microhouse and Ncompass cottage company will be hosting the first of three free backyard cottage workshops. During the workshop we will discuss the backyard cottage ordinance including details of who can build a backyard cottage, what it might look like, and the how of construction. In addition, Justin Arnold will be there to discuss construction financing options. A Matt Long from Husky Senior Care will joining us to discuss aging in place strategies and the design, construction and use of backyard cottages for seniors. Join us at the Phinney Neighborhood Home Design and Remodel Fair along with a wealth of some 70 other building trade professionals and representatives from Seattle’s Department of Planning and Development. Drop ins are welcome but we prefer it if you RSVP so we can be sure to accommodate you. A current view of Ben and January's magnolia backyard cottage. The drywall is up and the finish work is beginning. Landscaping should start any day now. Because of the steep site, limited area, and to protect a mature cedar tree on this ECA site, this backyard cottage was able to take advantage of the parking waiver. In most cases one additional parking space is required for a new backyard cottage. Would you like to learn more about backyard cottages? 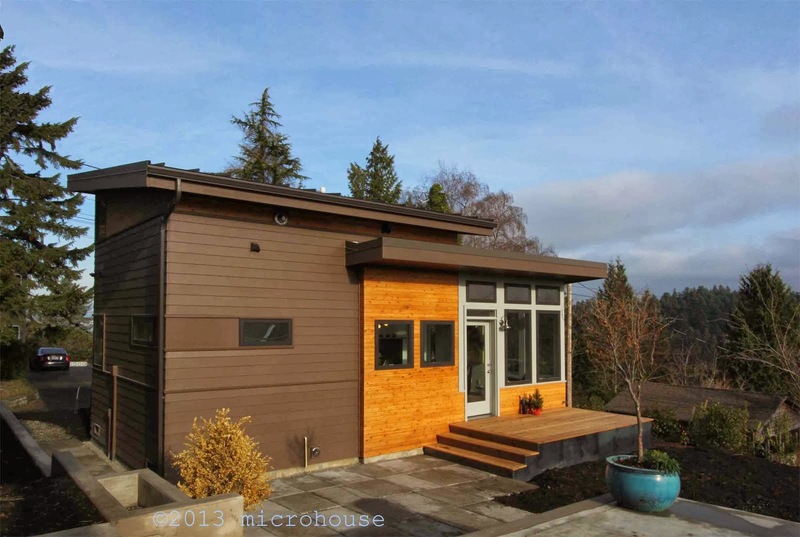 Microhouse and Ncompass cottage company will be hosting a free backyard cottage workshop Novermber 9th in West Seattle. During the workshop we will discuss the backyard cottage ordinance including details of who can build a backyard cottage, what it might look like, and the how of construction. In addition, Justin Arnold will be there to discuss construction financing options. Bring your ideas, after the presentation we will have plenty of time to answer questions about the specifics of your project. November 9th, from 7:00 to 8:00 PM, at the Community School of West Seattle, 9450 22nd Avenue Southwest. Downturns in the economy usually coincide with an increase the number of multigenerational households. But what's going on now is more than a recessionary blip. The fraction of the U.S. population 75 or older has increased from 5.2% in 1990 to 6.4% today. At the same time, the percentage of those 75 and up living in their adult children's homes has been climbing too, from 4.1% in 1990 to 6.5% today, reports Kelly Balistreri, associate director of the National Center for Marriage Research at Bowling Green State University. There are many financial aspects affecting the number of those living in multi-generational households. These include the increasing costs of health care, in-home care, and child care. While those living in multi-generational households will attest to the added challenges there are innumerable benefits that go well beyond financial gain. Three generations of Mary K's family live in the Wallingford neighborhood of Seattle. She now lives a number of hours drive away but hopes to move closer to her new great granddaughter. How much closer? Into her daughter's back yard. Seattle's recently expanded backyard cottage ordinance allows her to do just that. Seattle and many other cities allow backyard cottages, detached accessory dwelling units, to share a lot with an existing primary residence. Mary K plans to build a tiny backyard cottage that will give her a comfortable place to live where she can be a more prominent part of her family’s life. Her new kitchen window will look out on a shared garden and her cottage will feature a loft for her great granddaughter to play in. She looks forward to taking her great granddaughter to the nearby woodland park zoo. No doubt Mary K’s family will appreciate the extra help as well. Raising a child is expensive in no small part due to the cost of child care. 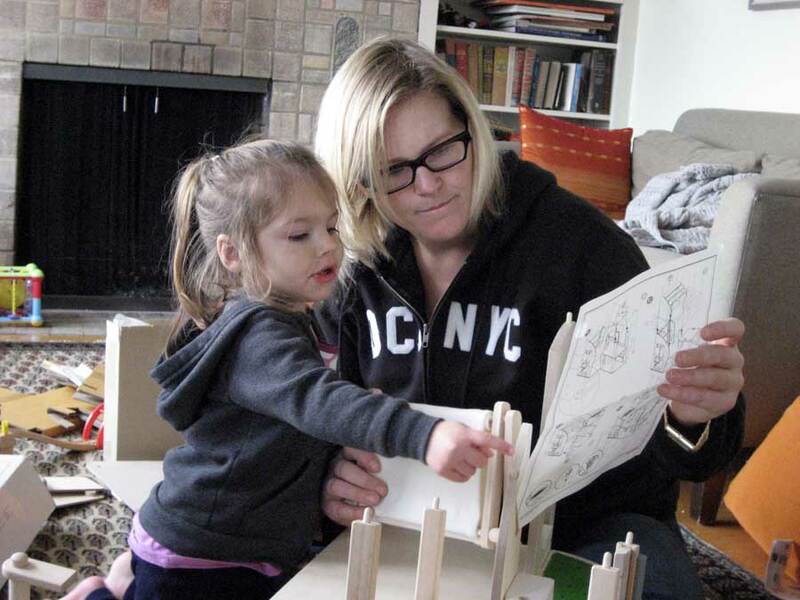 Many parents scramble to keep up a juggling act of work and child care schedules that result in children being raised by caregivers outside the family. In this day and age it seems the lucky exceptions that have family close enough to help out on a regular basis. Her backyard cottage will have another benefit as well. Mary K will pay to construct the cottage from her savings. It will be her home but will also be an asset for her daughter’s property. When she no longer lives in the cottage it will become a source of rental income for the family, or perhaps her great granddaughter’s college apartment. Mary K’s cottage is schedule to begin construction in the early spring. A new kind of housing can be built in Puyallup under temporary rules recently approved by the City Council. The demonstration ordinance, which has drawn debate at council sessions in recent months, allows up to three cottage housing projects over the next three years. “It’s my belief that our community needs some alternative housing,” said Councilman Kent Boyle, who supported the ordinance. Some in attendance expressed concerns that cottage housing would result in an in appropriate amount of density, allowing developers to cram too many houses on a single lot. However, other municipalities including Seattle have experimented with demonstration programs that have resulted in some great projects. Because the size and scale of cottage housing developments are often strictly limited, the developments seldom feel too crowded. Furthermore, because they are grouped around common landscaped areas they often appear more open than the surrounding single family homes. There are many fine examples of cottage housing scattered around the region. These historic cottages on 16th Ave in Seattle are 550 square feet and have one bedroom and one bath. These 10 cottages share a double city lot and fit seamlessly into a neighborhood of other single family homes. In this case they have only a small common area yet they still feel welcoming. They were built for and still provide a great option for young professionals who want to be close to work, don’t need to much space, and don’t want to live in a sterile apartment building surrounded by parking. Cottage housing can be adapted to meet the needs of specific groups. Seniors have different needs than young professionals or families with children. Cottage housing can be built around amenities that suit the needs of seniors and allow them to share some expenses while still maintaining independence. Charles Emlet, who’s on the city’s Aging in Place committee, told the council that cottage homes are a good option for older citizens. “Personally, I like the idea of cottage housing. My wife and I have talked about (one day) buying into such a community,” Emlet told a reporter before the meeting. 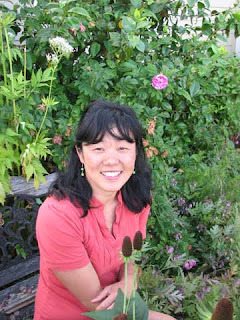 “I like the idea of being connected to your neighbors.” Many active seniors like having an opportunity to socialize and garden outside. New cottages can also incorporate accessibility features that make it easier for seniors to live independently without the maintenance required for owning larger home . As we approach the beginning of October, construction of the Ben and January's backyard cottage is well underway. The cottage will feature two bedrooms and one bath and will be used as a rental unit. Anri Rapelje is a landscape architect that we have worked with on a number of projects including the Magnolia Eco Cottage. Landscape design is an important part of any small house design. In this case, the cottage is located on a particularly difficult steep slope site with stringent environmental requirements. 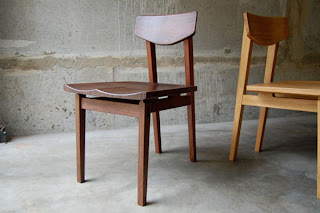 Despite the constraints, Anri was able to create a beautiful, functional and affordable design. The plantings should be going in late this fall and we will be updating or blog with photos as they become established. The Wenatchee City Council recently hear a presentation of proposed changes that will make it easier to build cottage housing among other projects. The council will vote on these changes in October. Wenatchee is hoping that allowing cottage housing will encourage the infill of new homes. Infill developments utilize less municipal resources than construction in previously undeveloped areas. They also save forest and farm land and lend themselves to walkable communities. Cottage housing units are typically smaller than traditional houses usually under 1,200 sq. ft. They make up for some of the lost square footage by creating inviting shared spaces and common amenities. While cottage housing isn't for everyone. Those who do live in cottage housing developments enjoy the camaraderie of their neighbors. One of the hurdles to cottage housing development is providing parking required by zoning codes. The common areas on small lots can quickly become dominated by parking areas reducing the amount of land left over for landscaping and common areas. At the same time, Cottage housing developments because of their size and in city locations, tend to appeal to single occupant households, seniors, and those who use public transportation. Wenatchee's proposed changes would also reduce the number of required parking spaces making cottage housing developments more viable. Our fremont kitchen is the kitchen of the week on Houzz.com check it out. 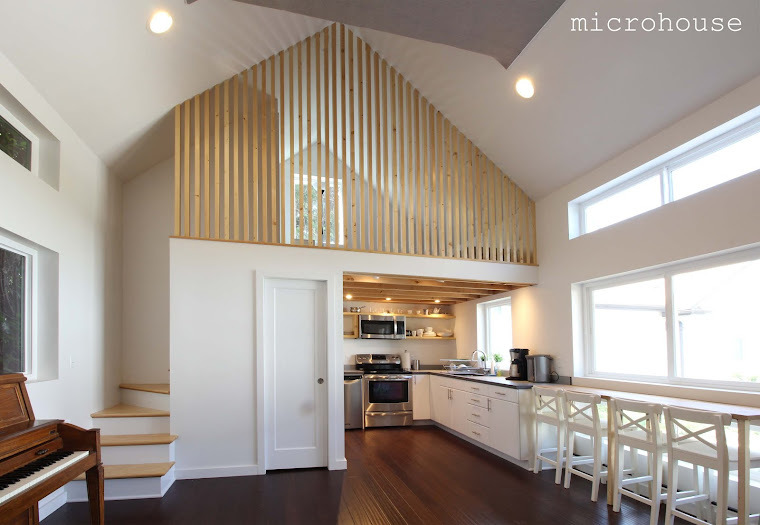 The project embodies many of the philosophies that we at Microhouse incorporate into our small house designs. Our goal with this project was to come up with a design that would bridge the gap between the needs of a contemporary living and our 1920’s craftsman house. The commonality that served as a departure point for me was the utilitarian nature inherent in both craftsman kitchens and modern design. For this reason I designed cabinets that emphasized clean lines, simple detailing and richness of reclaimed old growth fir. 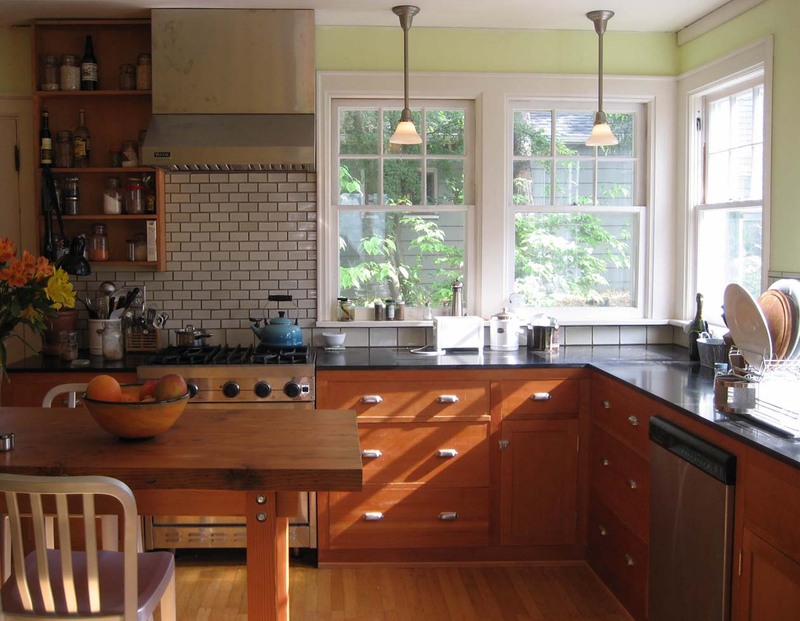 I found the kitchen cabinet designs of famed famous architects Green and Green inspirational. It is hard to describe the quality of sunlight in the Pacific Northwest but it is often muted, filtered by layers of clouds, and always precious. For this reason the quantity and placement of windows was crucial. We concentrated the windows to the east and north enabling us to capture morning light and open out onto our patio and garden. The small size of our house made the connection to the outside that much more important giving our kitchen an added expanse. Rather than using above counter cabinets that would have limited the amount of windows, we created a “pantry wall” on the interior West wall. This efficiently provides storage for bulk goods/ books and dishes. We created another small group of open shelves adjacent to the refrigerator and adjacent to the dining room for every day plates and dishes. Using reclaimed materials was really important to us for many reasons not the least of which was sustainability. The timeless quality of the old growth fir we used is apparent in its rich color and slight imperfections. 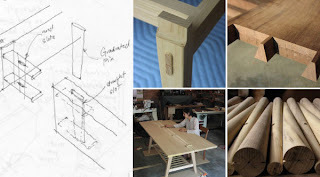 For the window construction we again used reclaimed fir for its straightness and durability. The top sashes were obtained from local architectural salvage store. The bottom sashes built from fir and we went to great lengths to use reclaimed wavy glass which is particularly nice on the interior cabinet doors. We also used reclaimed top nail oak flooring which enabled us to seamlessly match the new flooring areas with those of the existing house. Where we didn’t use reclaimed materials like the granite counter tops we opted for durability. The kitchen table was created from a ships hatch that my father found on the beach way back in the 1960’s. It was fun to be able to incorporate this family relic into the design. 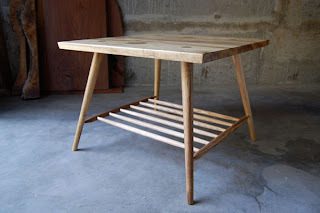 The table frame was made from the fir studs taken from the wall that separated the original kitchen from the kitchen dining area. The table is the focus of the kitchen. It is a great place to idle away a rainy weekend morning with a cup of coffee watching the raindrops travel down the rain-chain just outside. Well at least it would be if we ever had idle mornings. We built it to cabinet height so that it readily becomes an extra work surface. The person cooking usually sits on the stove side where it is easy to swivel between the stove and table. One of the most exciting things about cottage houses is that they embrace simplicity and connection to place and community. By necessity, the focus is on the most important functions and qualities of a dwelling. Clustered cottage housing developments provide us with the opportunity to re-imagine some of the best qualities of traditional villages. As people seek to live more simple purposeful lives cottage houses and cottage housing developments have been enjoying increasing popularity. 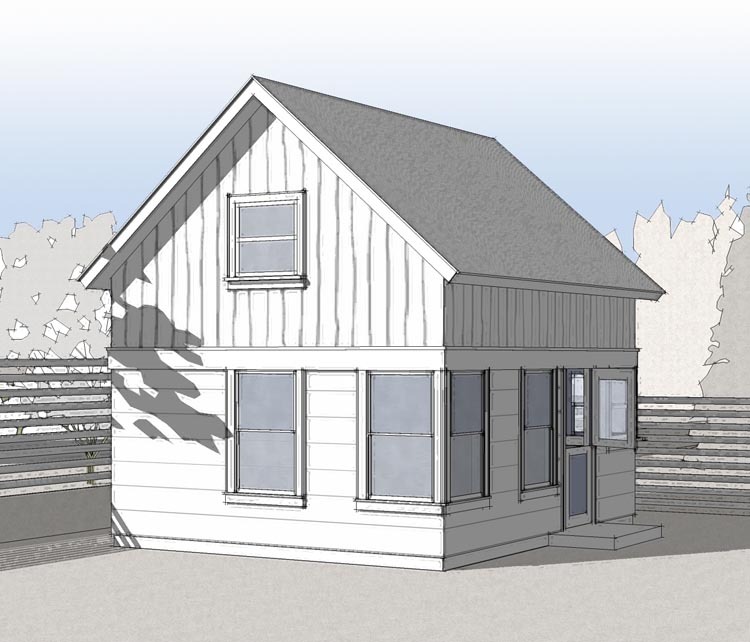 At microhouse we are excited to begin the design of the nine-unit pine grove cottage housing project. These 550 sq. ft. mini houses will incorporate the all of the functions of a larger house including one bedroom, one bath, a kitchen/dining room, living room, formal entry, and large front porch. Here the front porch will provide its traditional role as a nice place where people can interact with their neighbors. While the clustering of these cottages around shared common spaces, including gardens and natural open space, will create opportunities for informal social interactions and chance meetings. The pine grove cottages provide affordable model for future development. Efficiently meeting the needs of the residents will literally and figuratively reduce the developments footprint. Clustering development reduces building cost and infrastructure costs, reduces environmental impact and leaves more open space for natural plantings or gardens. Spokane like many cities has developed a comprehensive plan to develop strategies and policies to sustain and enhance those attributes that currently make it a desirable place to live. The City identified accessory dwelling units (ADUs) as one viable strategy to help meet the dual goals of increasing housing options and density while maintaining and enhancing the quality of the community. Allowable Lots: RA, RSF, RTF, RMF and RHD zones if the lot is 10,000 square feet and larger. If the lot is located on an alley the minimum lot size is 5,000 sq. ft. Size: 600 sq. ft. maximum. Occupancy: owner occupancy required in one of the two units. An under eave closet is a great space saving idea for small houses. 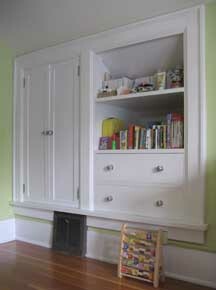 This closet utilizes the otherwise wasted space located under the eaves and livens up the room. In many small houses the roof rafters rest directly on the top plate of the first floor simplifying construction and lowering costs. The trade off is partial height under eave space. The closet illustrates one way this space can be utilized. Nooks for beds are another popular use for under eave space. Seattle has recently updated it's multi-family zoning code and released the details to the public. What does it mean for residents? Are you a landowner who wants to know what these changes mean to you? Read on. For lot specific information contact us for a free or low cost analysis for property owners. The Seattle Multi-Family code has been updated for the first time since the late 1980's. The new code offers carrots and sticks to builders. Some of the carrots are; reduced building setbacks, increased height limits and finally a retooling of the allowable building width depth requirements in favor of a more flexible floor area ratio limit. The sticks are; reduced allowable unit densities and for many projects design review and increased landscaping and green building requirements. Will design review result in better projects? Only time will tell. It is hard to legislate good design but perhaps with more flexibility granted in the design review process better projects will get built. It will come at a price though. I estimate that design review will tack on a minimum of $30,000 in cost and six months to a year in permit time. This aside from creating a scramble amongst builders for previously permitted projects, will ultimately result in increased prices for buyers. Since the 1980's Seattle has undergone tremendous growth. Particularly in later years, townhouses have become the affordable housing option of choice. In part because of their popularity and often times because of their scale and apparent lack of addressing the street in a neighborly way, the new code takes townhouses head on. Perhaps the biggest change will be a requirement for design review for two or more townhouse units. One hopes that this will result in townhouses that have units that have primary entrances and glazing that face the street at the ground level. This will now be regulated in a manner similar the way in which it is currently is in commercial zones. Ever wonder why so many townhouse projects have veil fattening pen like fenced yards? It is the old zoning code. The new code will relax the requirements for the separation of open space which combined with the new landscaping requirements should contribute to nicer street-scapes. Rowhouses will be the big winners under the new code. Requiring no side yard setback and no design review we will be seeing more of these. Cottage housing will continue to be a popular housing choice for both buyers and builders. Cottage housing offers an affordable housing choice for those who don't need a lot of space and like connection to the earth. Sadly, despite a great number of highly successful old and new cottage housing projects the new multi-family code doesn't make any real concessions to cottage housing. Congregate housing will continue to be allowed in both single family and multi-family zones is becoming a viable option for students, senior citizens and others who don't need or want to pay for a full kitchen. Here are some highlights of the revised code from the Seattle DPD web page. Join Microhouse and Ncompass cottage company for the first of two free backyard cottage presentations offered this summer. We will discuss general guidelines for backyard cottage design and construction. Bring your questions and ideas for your project and we can help you determine feasibility and establish a budget. Community School of West Seattle, 9450 22nd Avenue Southwest. For more information or to RSVP for a workshop, contact bruce@microhousenw.com or call 206-428-8599. Front porches are a predominant feature of traditional neighborhoods. 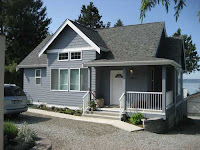 In cottage housing increased emphasis is placed on community and the front porch again plays an important role. The resurgence in popularity of cottage housing and in new urbanism principals have been mirrored by a national trend of new homes with front porches according to a study by the National Association of Home Builders. Like pieced quilts and chair rail, the front porch was born of practicality. It provided Grandma and her front rooms shade from the hot sun. Although two acronyms nearly killed the front porch in the 1950s — TV and AC — it is enjoying a renaissance, thanks to the New Urbanism movement and a renewed appreciation for all-things-Grandma. More than a collection of square feet, the front porch is the architectural version of a hug, the hyphen between our indoor and outdoor spaces, the green room that separates our public and private lives. In 2007, 62 percent of new homes had porches, up from 50 percent in 1999, according to the National Association of Home Builders. The South and West are the most porch-crazy regions, with the Midwest close behind. The front porch ranked higher than the patio and rear porch on buyers' wish lists in the NAHB's "The New Home in 2015" report. "It changes the tempo and pace of your life," said Gail Warner, a public relations consultant who bought a house with a front porch in a planned community in Fort Mill, S.C., in 2007. "We're out there in the evening with our porch mayor (pet dog), having a glass of wine and talking to the neighbors. We all have front porches here, which means we all know each other. When a neighbor needs help, we galvanize." Before moving to Fort Mill, Warner and her husband lived in a porchless town house. "Nine years there, and I never knew my neighbors," said Warner. The couple's house also has an upstairs front porch that she calls her "ponytail porch" because the added distance from it to the sidewalk gives her privacy. "There's an unwritten law that if you're on your upstairs porch, you're not dressed and not ready to be social," said Warner. "But if you're on your downstairs porch, everyone's welcome." The front porch is one of the features that helped sell 21 of 26 houses in nine months at the SchoolStreet Homes development in Libertyville, said developer John McLinden. The Craftsman- and bungalow-style houses, which start at $525,000, showcase architect/author Sarah Susanka's "Not So Big House" tenets. Even homeowners who do not use their front porches want them for curb appeal, said Jason DeBaker, managing principal for Orren Pickell Designers & Builders in Lake Bluff.